This article describes how to install and use X-chat, a popular IRC software. It is recommended to install HexChat, a fork and continuation of X-Chat. It is activelye maintained and looks almost the same. It supports SASL out of the box. All the commands mentioned here still apply just use hexchat instead of xchat. There is a guide on how to migrate from X-Chat to HexChat. 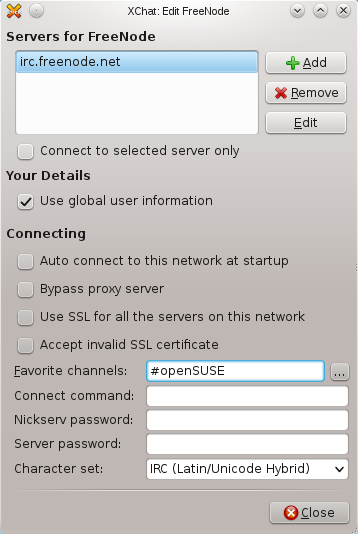 5 Where can I find a list of openSUSE IRC channels? /help - Shows all commands. /nick NewNickName - Changes the NickName (limited to 9 characters). /names - Shows all NickNames on that channel. /away AwayMessage - Leaves a message when you are away from channel. Use /away by itself when you return. /quit QuitMessage - Leaves a message when you quit IRC channel. Type a Nickname of your choice, Name and Real name. Choose FreeNode and then Edit. Visit How to register your nickname. where you can add your favourite channel, the channel you visit often. Press Connect button and you're connected to the IRC Freenode server. The protocol is followed on some IRC meetings only if it's agreed by the participants. The reason that we use it is to follow the thoughts of the speaker. Please watch what others are doing and do not interrupt. If you have a question, type "?" and wait for the chairman to let you speak. If you need to speak, type "!" and wait for the chairman to let you speak. If you're done speaking, type "eof". If you agree, type "+1". If you disagree, type "-1". If you're neutral, type "0". 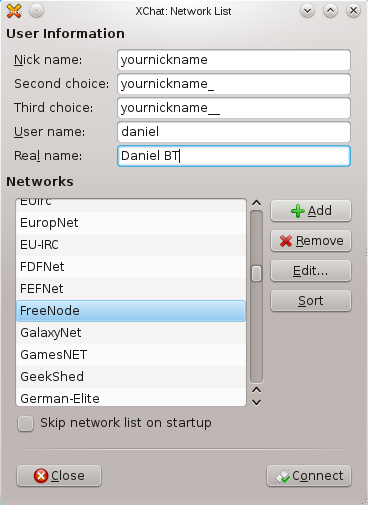 Where can I find a list of openSUSE IRC channels? This page was last modified on 26 November 2015, at 12:19.